Sometimes the name of a place is a good indicator of what to expect. Abel Tasman. The name has an exotic, but peaceful ring to it. And that is what you will get. It is a passage to a world free of technology, human influence, pollution, noise, and cubicles. 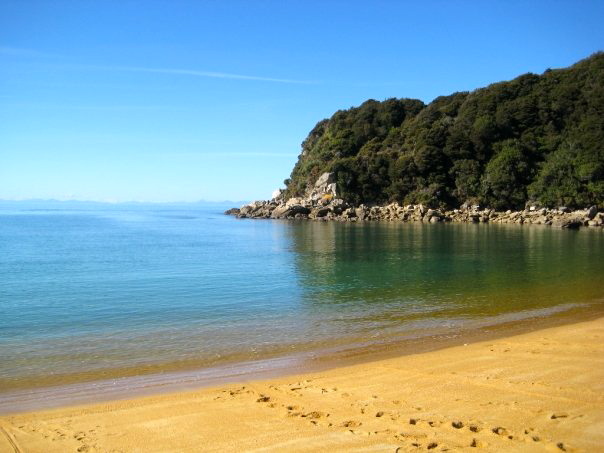 Although I loved all of New Zealand, Abel Tasman is in my top three favorite places in this beautiful country. Since I didn’t have enough time to go hiking through the park, I decided to kayak in the Tasman Bay along the coast of the park. If I had a personal Guinness Book of World Records (that people actually cared about) then you would see Abel Tasman listed three times. It holds the record for being the quietest place I have been to. The only sound that could be heard was the occasional bird call, seal grunt, or paddle cutting in and out of the water. Even when I was on the shore, eating lunch, the waves breaking on the sand were so gentle that they hardly made a sound. This quietness filled me with immense peace and provided the perfect opportunity for self reflection. Following this peaceful theme, the second record this national park would hold is the calmest ocean water I have ever seen. I felt like I was on a calm lake with a slight breeze causing little ripples throughout the entire body of water. There were no waves (on the shore or in the middle of the bay). The biggest waves I saw were caused by a larger than life gentlemen and his slightly skinner counterpart (Luckily the huge tidal waves were being created behind me and did not swallow me with my kayak). The final record would be for the most exotic sand. I have never seen sand like I did in Abel Tasman. Caught between the turquoise water and the green forest wall, the yellow sand seemed to emanate a golden glow. The sand was soft and appeared untouched by man. There were no footprints or trash, just the trickle of the waves against the soft golden sand. 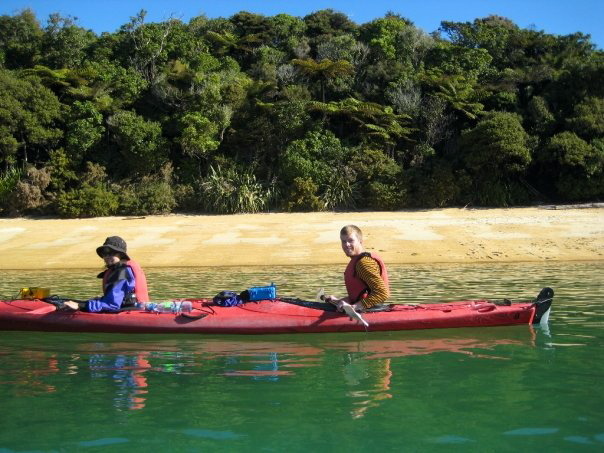 If you have a chance to go to Abel Tasman, I highly recommend kayaking. There’s nothing like cruising at a steady pace and enjoying the scenery. Plus one of the best parts of the day was paddling to an island covered with seals. Most were getting their tan on and sleeping, but every now and then one would stir and make a sound or go for a dip. It was fun to circle the island and see all different sized seals. Some had too much to eat. Others would fit in your arms. 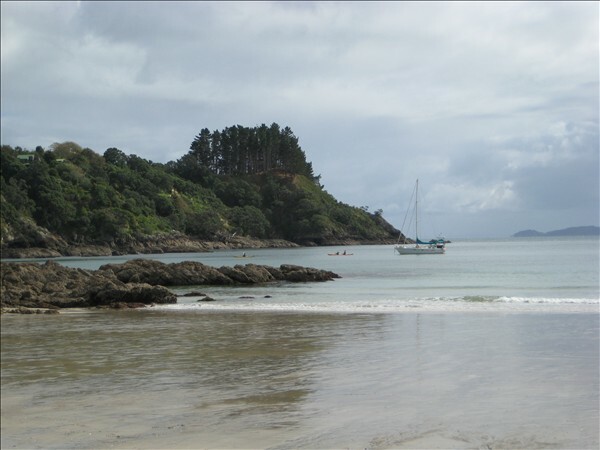 All in all two words provided me with and peaceful and enjoyable day, Abel Tasman. Nelson, New Zealand is absolutely amazing! It is home to three national parks: Abel Tasman, Kahurangi, and Nelson Lakes. Unfortunately, I did not have enough time to explore them all, so I decided the next best thing was to get a bird’s eye view of Abel Tasman and Kahurangi National Park (seeing 2 out of 3 isn’t bad). Since I can’t fly, I got on a plane that requires you to find your own way back to the ground. 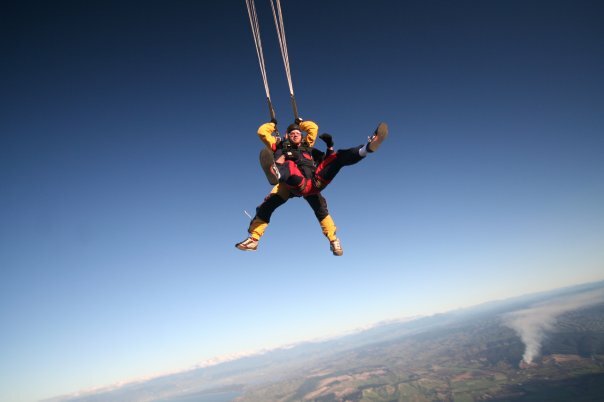 I had wanted to go skydiving for years, and what better place to go than the country of adventure? When I got to the skydiving school, I found out that I had a 20 minute wait. After years of waiting, I figured 20 more minutes wouldn’t hurt. Wrong! In those 20 minutes I saw a girl crying from fear, people too scared to get on the plane, and individuals falling out of the sky. The more time I waited, the sweater my palms became. Even though I was getting nervous, I was too excited to become scared. Once the plane took off, the realization that I would soon be descending without it began to set in. Luckily I was able to focus my attention on the beautiful scenery. It was a perfect clear day, which allowed me to see Abel Tasman and some of Kahurangi National Park. I could see green forest covered mountains rolling down to the beach and into the Tasman Sea. Before I knew it, we were at 13,000 feet. As I sat on the edge of the plane, I felt like the girl who was crying (only I was too scared to cry). This was mostly due to the fact that I sat there, for what seemed like forever, looking down while I waited to jump. When we finally got the signal, I got hurled out of the plane. I did a flip and then straightened out. 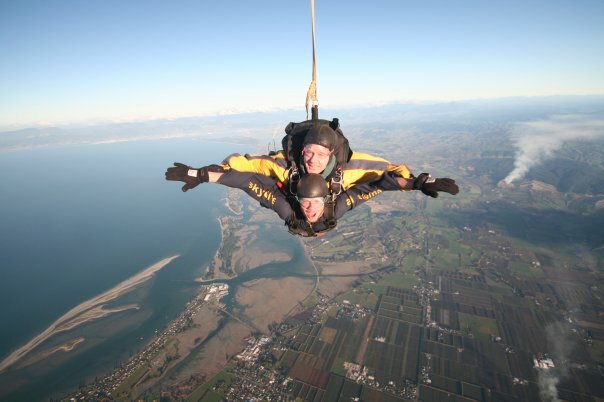 There is nothing like seeing New Zealand from 13,000 feet, then 12,999, 12,998, 12997 isn’t that cool, but 12996 is awesome. 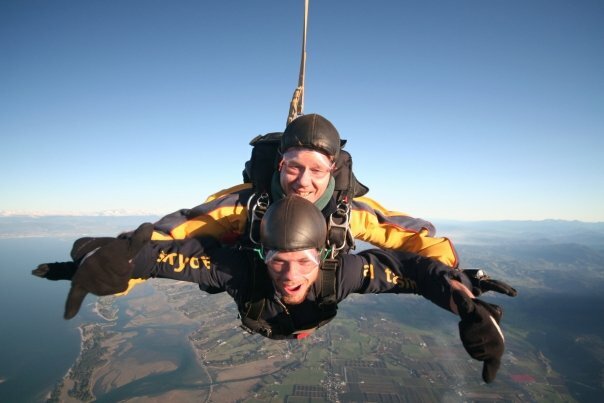 For anyone who has not gone skydiving, you have to do it! It is the coolest feeling. For the first few seconds I had a falling sensation, and then I felt like I was flying like Superman! That is the best way I can describe it. You feel like you are flying. The amazing scenery and the incredible feeling of flying made this one of the greatest experiences of my life. What’s the coolest thing you have ever done? Have you ever been somewhere so unique that you feel like you are on a different planet? When I was lowered over 100 feet into a bottomless crevasse at Fox Glacier, I felt like I was discovering Superman’s Fortress of Solitude (for those who aren’t Superman fans, it’s Superman’s North Pole retreat). It was a weird feeling to be all alone surrounded by two never-ending walls of Kool-Aid blue ice. 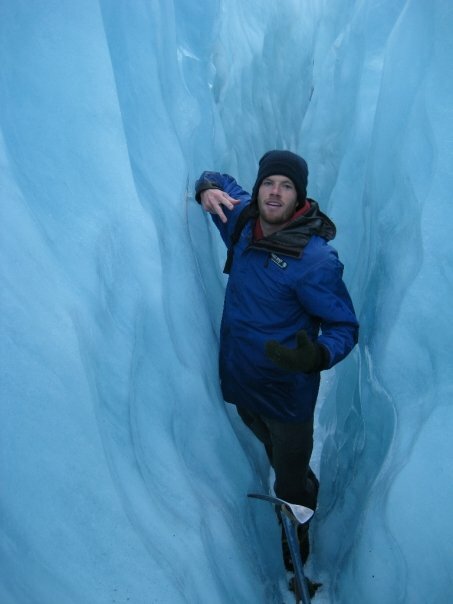 Before I began my long climb out of the crevasse, I spent a few minutes enjoying the amazing beauty of the glacier. It was unlike anything I had ever seen. Although dangling by a rope in the middle of a crevasse had a surprisingly eerie feeling to it, I couldn’t help but enjoy the silence and thoughts of Superman. The climb out of the crevasse was made difficult by a long sloping ledge on the wall. We had practiced climbing up vertical walls beforehand, but we hadn’t climbed any walls that had a slope. As I went somewhat horizontal on the slope, I began having difficulty keeping weight on my crampons. A couple of times one of my crampons would slip, but I was able to recover and make it to the top of the ledge without falling. By the time I made it up and over the ledge, I was tired (ice climbing isn’t as easy as it looks). Fortunately for me, the next thirty-five feet was an easy vertical climb. Once I made it to the top, a feeling of accomplishment rushed through my body. What added to this feeling was the loud cheering of the instructor and the other group members. I felt like I had just finished a marathon…a marathon on ice that is. Just as a side note, ice climbing is apparently not like Vertical Limit and other ice climbing movies. Our instructor told us not to leap towards a wall and try to stick our ice axes and crampons into the ice. She said it wouldn’t work, and if it did, you would end up dislocating your shoulders. I don’t know why, but she looked right at me when she was giving us the lecture of what not to do. Since I knew Hollywood tells no lie, I disregarded her “safety” message. I ran and jumped towards a wall and stuck my crampons and ice axes into the ice. Once I landed on the wall, the ice immediately broke, and I slid down the side of the wall. Luckily the soft ice of the glacier broke my fall. Everyone just shook their heads as I laid at the bottom of the wall. 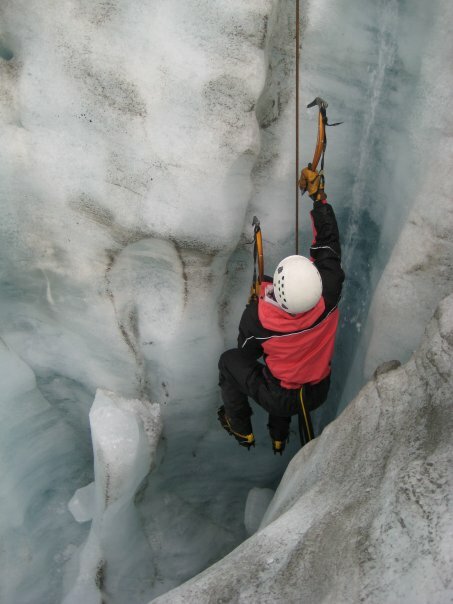 Hiking Franz Josef Glacier and ice climbing Fox Glacier were two events I will never forget. Everyone needs to be lowered down into a deep and lonely crevasse once in their life. It is unlike anything you have ever experienced! Where’s the most unique place you have been? I went to New Zealand for an adventure of a lifetime, and although picking macadamia nuts with a hippie was pretty adventurous, I was ready to do something really crazy. Since the Auckland Bridge was just a few minutes away from my hostel, I decided that jumping off of a bridge would be the right way to officially begin the craziest trip of my life. Although I felt confident that I could survive the 132 foot fall from the bridge into the water, I decided to let the people of AJ Hackett tie some rubber bands to my ankles, just as a precaution. 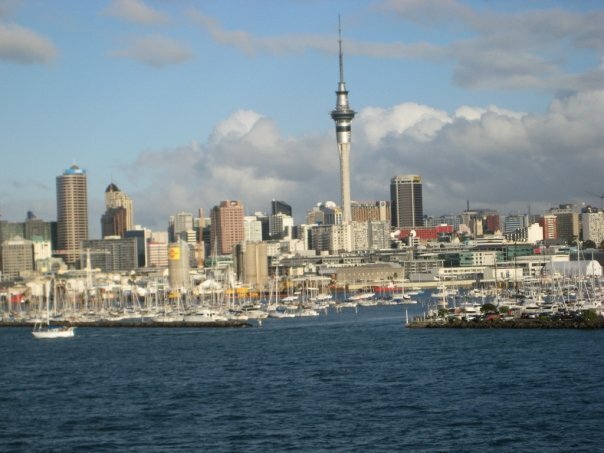 The hike up the bridge to the bungy platform provided an amazing view of Auckland and Waitemata (Auckland) harbor. I really appreciated the view as we climbed the bridge because it helped me forget that I was about to do something stupid. When I got to the jumping area, I received the thrilling news that I was jumping last. I was excited because this meant I got to witness the horror and panic in people’s eyes and the paleness of their faces. While I waited, these images made me second guess my sanity (I probably should have known something was wrong with me way before this)! At long last, my turn had arrived. 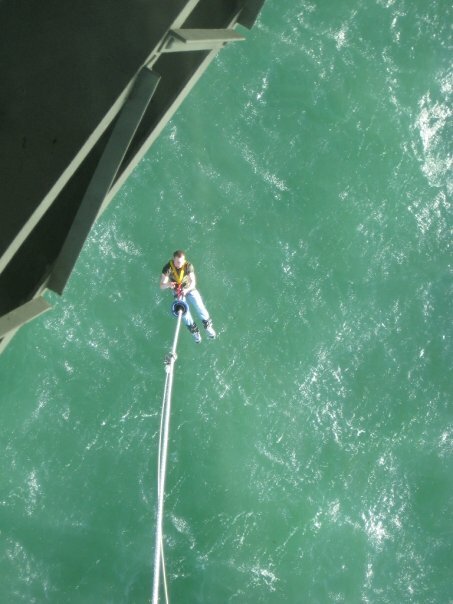 They strapped my ankles to the bungy cord and told me to walk to the edge of the platform. I quickly realized why people had been so scared as I attempted to waddle my way to the edge of the narrow platform without falling off one of the sides. Once I finally made it to the end, I made the mistake of looking down. I’m usually not afraid of heights, but knowing that I was about to fall 133 feet made my stomach drop. I could immediately feel the blood leave my face as I transformed into a pale faced, panic eyed little boy. When the countdown began, I was determined to jump, but at 3, one of the guys yelled “DON’T JUMP!” I was surprised that I didn’t jump (or fall) when he yelled at me. They told me that there was a sailboat race going on and that boats were now going under the bridge! To reassure me, one of the guys said, “We’ll have to time your jump just right, so be ready to jump.” Hearing this, all the determination to jump left. There would be no surviving a face full of boat. I stood on the edge of the platform forever, and then I heard the scariest words of my life (besides what do you think about marriage?) “Ready! 3,2,1, jump!” My heart was beating so fast and a million thoughts were flying through my head, mostly “don’t do it,” but like an idiot, when I heard “jump,” I jumped. The feeling of falling was incredible. I couldn’t breath for the first 70 feet, but after that I was laughing and screaming (probably like a little girl)…until I hit the water. Surprisingly, it didn’t hurt to hit the water, in fact, it was a lot of fun. I went underwater to my waist line and then was immediately whipped back up. After bouncing around for a while, they began pulling me up. When I was about halfway up the machine stopped working. I wasn’t in a big hurry especially when they had told me before I jumped that there was a fleet of sailboats looking to hit anyone dangling from a bridge. My confidence about the whole situation was restored when I say them hitting the machine with brooms. I could see the rope slipping from the pulley and dropping me right on top of a sailboat (at least I would die in style). After a few good whacks, the pulley began dragging me up to the top. What a way to begin my adventurous trip! In May of 2008 I was on my way to New Zealand. Alone, with no plans or place to stay, I began wondering what I was doing. The cute girl sitting next to me eased my anxiety about having no plans for New Zealand, but gave me a new reason to feel anxious. Since my smoothness with the ladies is unparalleled, I turned to her, smiled, and then worked on a Sudoku puzzle in the airline magazine. Nothing drives women more crazy than a man doing a Sudoku puzzle. During the flight we began talking, probably because she saw me complete the Sudoku puzzle in record time. Jessie was from New Zealand, so I took the opportunity to ask where I should stay and places I could visit. After talking for a few hours, she invited me to stay with her and her family. 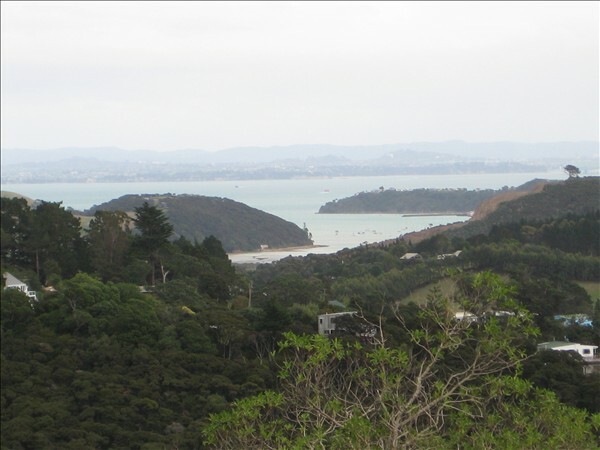 After a couple of days amongst the buildings, traffic, and noise of Auckland, I decided to go to Waiheke Island and stay with Jessie and her family. Even though it was just a 35 minute boat ride from Auckland, it felt like I had entered a new world. The island was very small. It seemed like there were only a few people living on the island because it was so quiet. At Jessie’s house, I met her dad and her brother. Her dad had long grey hair tied in a pony tail, scruff on his face, and a very relaxed demeanor. He told me his attitude towards life was “life’s a vacation.” The best description I can give of him is that he is a hippie. His life goal was to go to Europe and pick grapes. He told me this more than 100 times! In keeping with the picking theme, the next day, her dad invited me to go with him and pick macadamia nuts. I had to see what all the hype was surrounding the picking industry, so I agreed to go. Picking macadamia nuts was a first for me, and it was probably the last. We spread tarps below the trees and then hit the branches of the tree with rakes. We collected all the nuts that had fallen on the ground and use the tarps to put all of the nuts in the back of a truck. The entire day, Jessie’s dad had a huge smile on his face. I was amazed that someone could get so excited over picking macadamia nuts. Jessie’s dad taught me to find joy in everything you do, even if it is as small as picking some nuts. See Travel Tips under the category section for today’s travel tip!